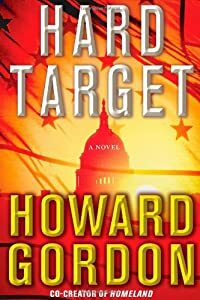 Hard Target by Howard Gordon: Synopsis and Online Purchase Options. Synopsis (from the publisher): Gideon Davis has settled into the quiet life of an academic and is weeks away from being married when he discovers evidence of an impending terrorist attack on U.S. soil. He brings his suspicions to his ex-girlfriend, FBI Agent Nancy Clement, but her bosses are leery of Gideon's source: a meth-head informant affiliated with a white supremacist group. Both Gideon and Nancy become increasingly convinced that a serious plot exists, but their informant is murdered before they can get more details from him. So Gideon enlists his brother, Tillman—newly sprung from prison through a presidential pardon— as an undercover operative to infiltrate a group of white supremacists who may be involved. Eventually, Gideon and Tillman get on the trail of the real conspirators and uncover their audacious plan to eliminate the entire top tier of the U.S. government during a high-value, mass-casualty attack. With only Nancy's support, Gideon and Tillman go rogue to stop the powerful titan behind the conspiracy before the entire government is toppled.